Looks Good from the Back: Adrien: One more for posterity. Oh, that's cute! My only hesitation is how it would look unbuttoned. I think the nature of the cotton cardigan is to be a bit droopy but I'm always a little surprised by the photos because it never *feels* that sad. If that makes sense. But yeah, more structure is probably the answer. Oh, I love this, even the cardigan! I've been following your blog for a while now but haven't commented until now. I just had to tell you how much I love that dress on you (cardi and all)! And that sick good bag is icing on the cake. Good times. I so love this dress! the colours photograph beautifully! Such a cute look! Love the printed dress. 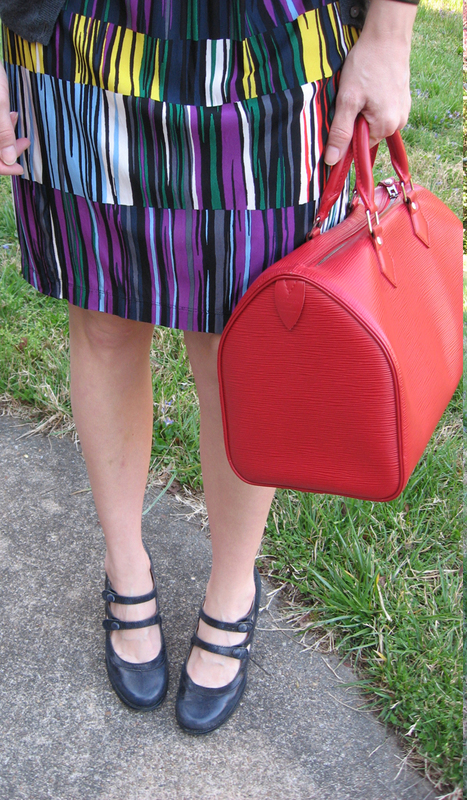 And that pop of red in the Speedy is just divine! Aw, thanks everyone! Y'all so nice.